We were really lucky (I jumped up and down with excitement for this one!) 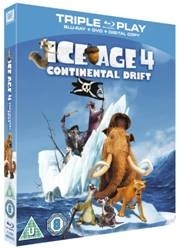 to receive a copy of Ice Age 4 continental drift to review - I'm a huge fan of the Ice Age movies and Blake got started on Ice Age last Christmas when I bought the Christmas special DVD. With this 4th instalment, we were not disappointed - I don't think the "Ice Age" franchise is going stale any time soon so please bring on Ice Age 5 soon! Ice Age 4 is action packed and full of the excitement you'd expect to find ... and some! This feature film includes pirates - one of my 3 year old boy's favourite things! There are bits that make even my 1 year old giggle and although there are moments of some combat scenes, I didn't feel that these were too much for Blake (age 3) who literally copies everything he sees. There's only one part which he felt was too scary (sea siren monsters) but this is a short part in the film and hasn't stopped him asking to watch the film. Ice Age 4 has become our most watched DVD of the week and even warrants a forfeit of Blake's usual choices and favourites for tv time! The triple play edition is excellent as it comes with blu-ray, DVD and digital copy. The digital version is on Ultraviolet which I'm fairly new at and to be honest I haven't figured out how to get the UV digital copies onto my iTunes library yet although it clearly states that you can watch it on ipad/ipod/iphone so I must be missing something obvious! The kids have their own dvd player in the kitchen and we watch on blu ray via the hubby's xbox in the living room so I really appreciate the triple play pack! In the dvd special features, my two little people love the Gutts sing along video and the Sid shuffle dance videos. I like guessing who the actor is behind the new character voices and was pleased that Nick Frost is one of them! Most importantly - Scrat and his acorn pops up a lot! Great stocking filler or extra for this Christmas! The world’s most beloved prehistoric herd is back and this time they’re setting off on a hilarious high seas adventure! ICE AGE 4: CONTINENTAL DRIFT sails into stores this Christmas available in Triple Play, Blu-ray 3D and DVD on 10 December from Twentieth Century Fox Home Entertainment. This all-new chapter in the beloved ICE AGE franchise reconnects families with herd favourites Manny, Sid, and Diego. Joining familiar friends of the Ice Age world on their latest journey is Sid’s long-lost and side-splittingly funny Granny plus a band of pirates led by the fearsome orangutan Captain Gutt. And no ICE AGE film would be complete without celebrated icon Scrat, whose existence revolves around the elusive acorn. Scrat once again returns with his very own exploits; however this time his pursuits result in world-changing consequences. The regular creative voices of Ray Romano (Everybody Loves Raymond) as Manny, Denis Leary (The Amazing Spiderman) as Diego, John Leguizamo (Romeo + Juliet) as Sid, Queen Latifah (Chicago) as Ellie, Seann William Scott (American Pie) as Crash, Simon Pegg (Shaun of the Dead)as Buck and director Chris Wedge as Scrat all return. This time they are joined by new cast members Jennifer Lopez (Made In Manhattan) as Shira, Peter Dinklage (Game of Thrones) as Captain Gutt, Nicki Minaj (New Year’s Eve) as Steffie, and Nick Frost (Shaun of the Dead, Paul), as Flynn. Loaded with a treasure trove of pirate-themed special features, ICE AGE 4: CONTINENTAL DRIFT is the coolest animated Blu-ray this Xmas. Adding an extra layer of enjoyment, the Triple Play and Blu-ray 3D offers families the opportunity to watch the film in “PARTY WITH A PIRATE!” mode. Here, the Pirate SQUINT will guide viewers through the Blu-ray menus and even ride along for some added swashbuckling entertainment. In addition, kids can get their groove on with the “Shimmy Shake Music Section,” a feature consisting of four fun-filled music videos to get you singing and dancing along with the herd. Adding to the ICE AGE fun is the Ice Age Village app, available for iPhone, iPod touch, iPad & Android smartphones and tablets. This mobile social game boasts over 30 million installs worldwide. Consumers purchasing the ICE AGE 4: CONTINENTAL DRIFT Triple Play or DVD will receive 10,000 free coins (in-game currency), an exclusive species and a chance to win an additional 10,000,000 free coins! · Scrat Got Your Tongue?